What is the perfect Adventure Travel rig? There is no real answer to that question, not in the general sense. The answer to that is different for every person and for every adventure. 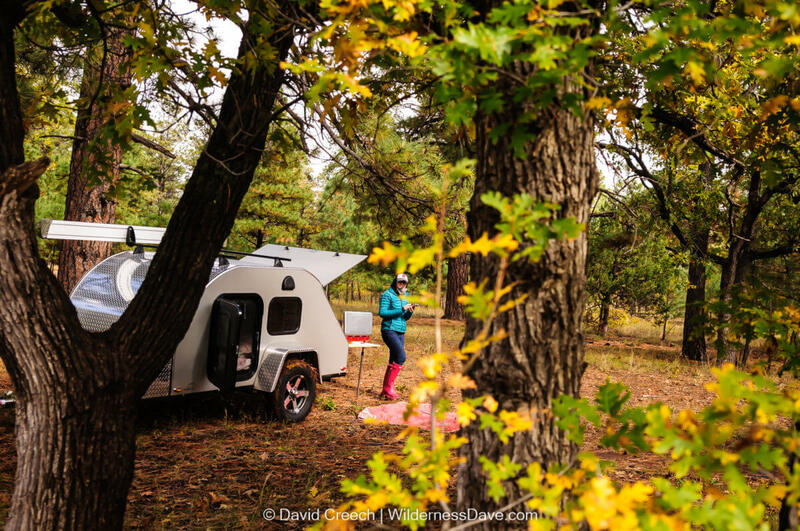 Since we started looking several years ago, there have been dozens of new companies making teardrop trailers and the designs all vary on the central and classic theme of the iconic “teardrop” design. 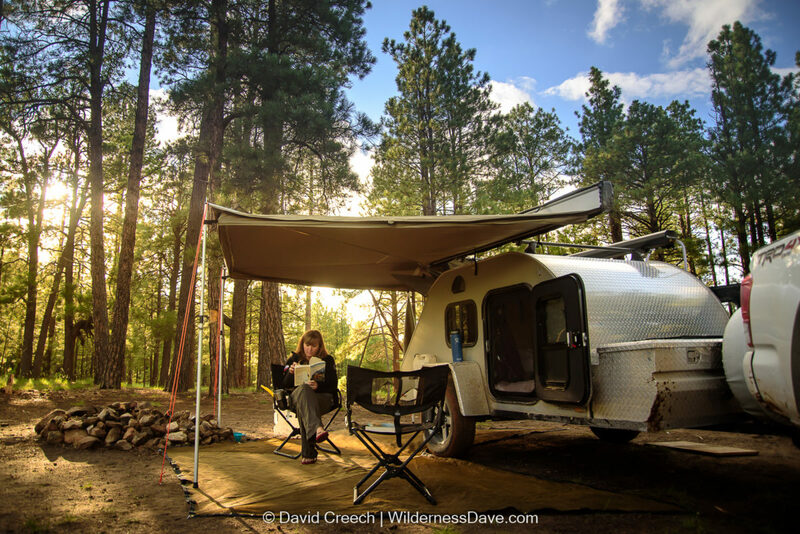 The idea is to stay light, fast and agile as you travel and the teardrop trailer offers that. 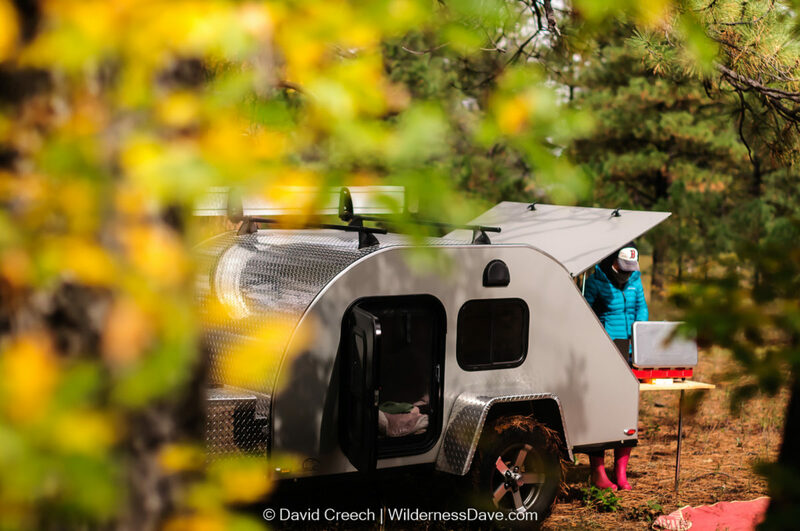 It may not be perfect for all things, but the teardrop trailer is damn near perfect for us, for most adventures. My wife and I got married in late 2012. 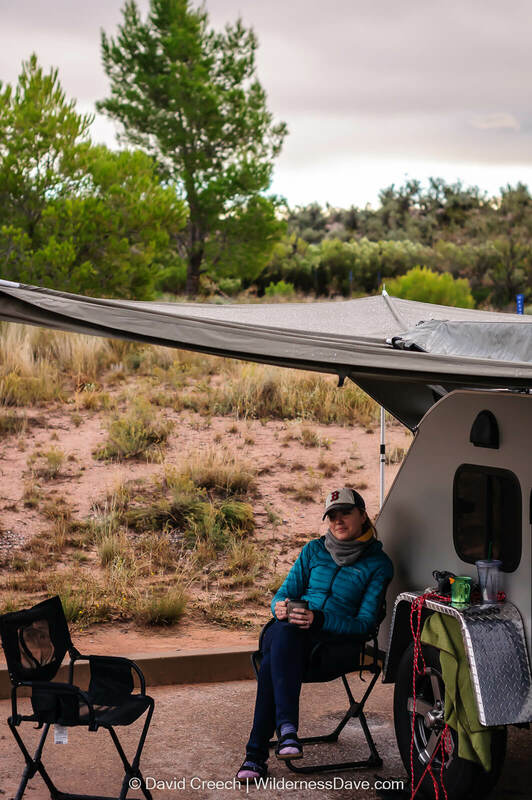 In 2013, as we began taking trips together across the southwest, the conversations about camping began to take on a new tone. What would we need to make longer trips easier and more comfortable? My wife was tiring of sleeping in a tent on an air mattress that refused to stay inflated throughout the night. As much as I love camping and roughing it, my nearly 40-year-old body was telling me that sleeping on the ground for extended periods of time might not be in my future either. So we started exploring the options. For my wife’s birthday that year, we decided to rent a teardrop trailer and head up to the Grand Canyon for about a week. It took a little adjustment but, ultimately, went incredibly well. On the way home from that trip we began scheming about how we could get a teardrop of our own. My wife made a new hobby out of shopping for trailers. New, used, antique, state-of-the-art, big, small…all were in consideration. It led to extended talks about our future. How would we use the trailer? Would we take the dogs? Would we ever have more than two dogs? Would we have kids? How long would our longest trips be? What vehicles would we be towing with? What kind of camping did we want to do? How self-contained should we be? The rabbit-hole was deep and the research went on and on. We’d been looking for a couple years when I talked my wife into coming to Overland Expo with me in 2015. Maybe we’d find something there that would suit our purposes. If nothing else, it would allow her to get a real-world idea of how these trailers could work for different purposes. That’s when we stumbled on to TC Teardrops. After some discussion with Carol at TC Teardrops about options and pricing, my wife and I settled on our trailer order decision with the options we thought we’d want/need. We placed the order and the custom build began. By October of 2015 we had our trailer. We couldn’t wait to take our new toy out for a spin. But first we had to get things set up. 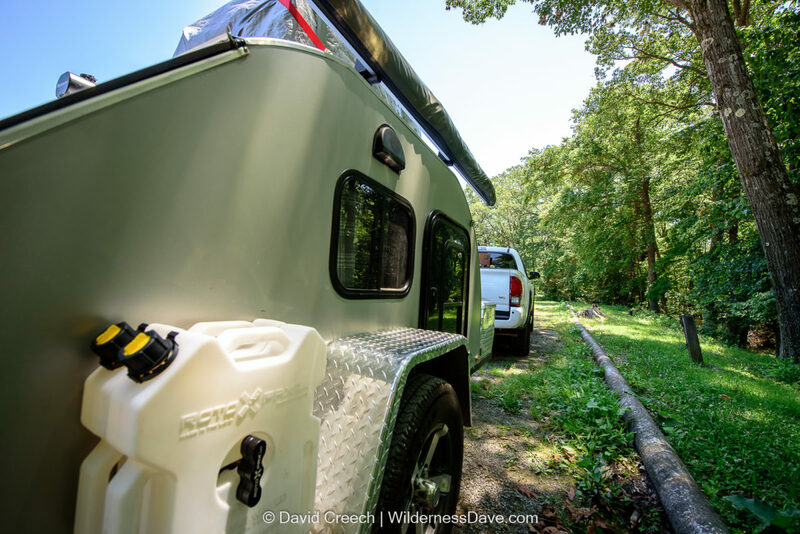 We got the battery hooked up, tossed in some bedding, outfitted the storage box with some basic gear, stocked the kitchen and made sure we had everything in working order. We wanted to squeeze as many nights into our first trip as possible so I loaded the trailer on the back of the Subaru that evening, picked my wife up from work and we headed north as the sun disappeared. A couple hours later, in the dark, I awkwardly backed the trailer into a spot at Dead Horse Campground in Cottonwood for our first night with the new teardrop. We were both grinning from ear to ear under the very impressive Foxwing Awning, sipping on steaming mugs of some tasty adult beverage. It rained that night. It rained hard. We slept like babies. It was still raining the next morning, but there was no wet tent to put away, no muddy tent footprint or soggy rain fly, no damp sleeping bags…it was nice. 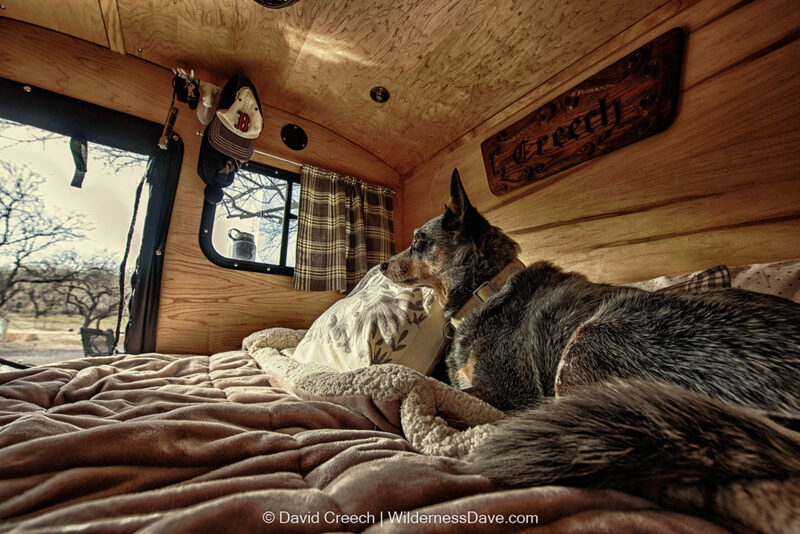 Close the doors, stash the chairs and fold up the Foxwing and we were ready to hit the road. It rained off and on that day as we headed further north and east into the high country. We made a couple of muddy stops for photos and snacks. My wife has named all of her cars, including the new Subaru. So it was not a shock when she started asking what we should name the teardrop. After tossing around both boy and girl names, we decided quickly enough that it was a girl. This narrowed the playing field. Our initial teardrop trip, the one that started the whole thought process, started out with a slightly creepy night in Bedrock City. This inspired some Flinstones-themed name options for our new trailer. Dino and Bam-Bam were in the lead before we decided she was a girl. One of us suggested Wilma. It immediately seemed to fit. 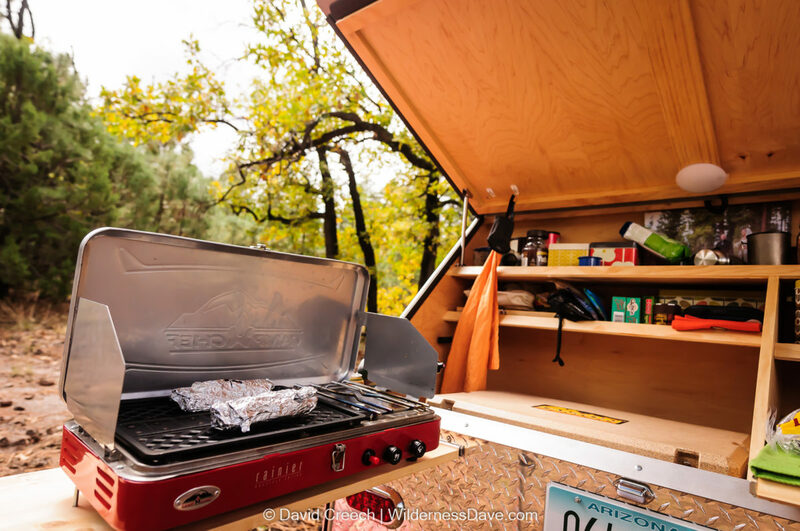 It had a classic, throw-back feel to it…like the teardrop trailer itself. We agreed, she would now be called Wilma. We visited, and stayed in, three separate state parks on that first trip in November with Wilma. We added two more on another trip later into southern Arizona. 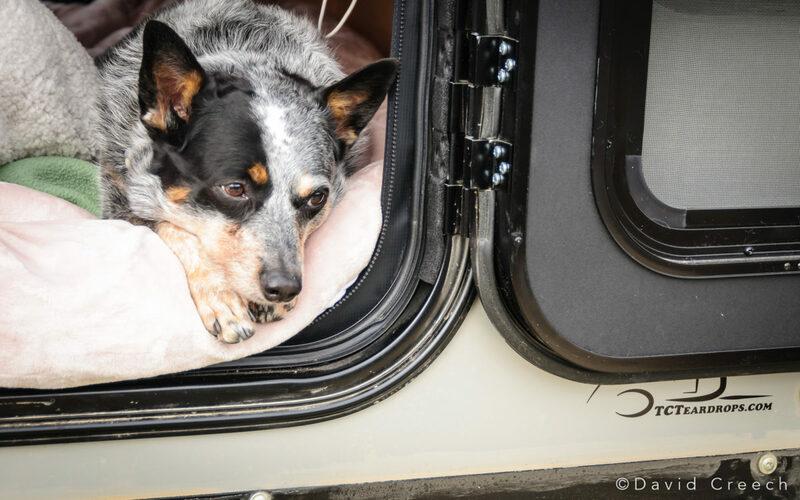 We have also taken her on a few short, bumpy, muddy trips into the backcountry and a fast-paced 5000+ mile cross country tour through 14 different states. Plenty of time to figure out what works and what doesn’t and make some adjustments. Our cattle dogs have become very fond of Wilma. They both know that when we start packing Wilma, a trip is coming. The older of the two dogs, Wiley, has a special relationship with Wilma. It’s her favorite place to be, it’s her home away from home, her happy place. I’m pretty sure she’d rather hang out in Wilma than anyplace else. She’s the first one asking to go in at camp and the last one up in the morning. We often joke that Wilma is the most expensive dog-house we’ve ever seen. Now that we’ve had Wilma on the road off and on for the better part of a year, we made some adjustments and improvements to the set up. You can read about the initial build order here. Since we’ve started traveling with Wilma, there are a few things that we thought were pretty important additions to the original build. Our original setup had no water storage. We would routinely buy a couple of two gallon water containers on our way out of town and use the melted ice from the cooler as wash water. It wasn’t ideal. So we started looking at storage solutions and settled on the low-profile Rotopax cans that we could mount directly to the side of the trailer. We now have three 2-gallon containers of water and one 2-gallon container of extra fuel mounted to the side of the trailer. Though a little pricey, I like the way they are stowed out of the way and well secured while traveling. I also appreciated that the mounts were not difficult to install. TC Teardrops is a Rotopax dealer and can install them if you order it when they build out your trailer. We are also storing an extra 5 gallons of water in our Road-Shower mounted to the roof rack. 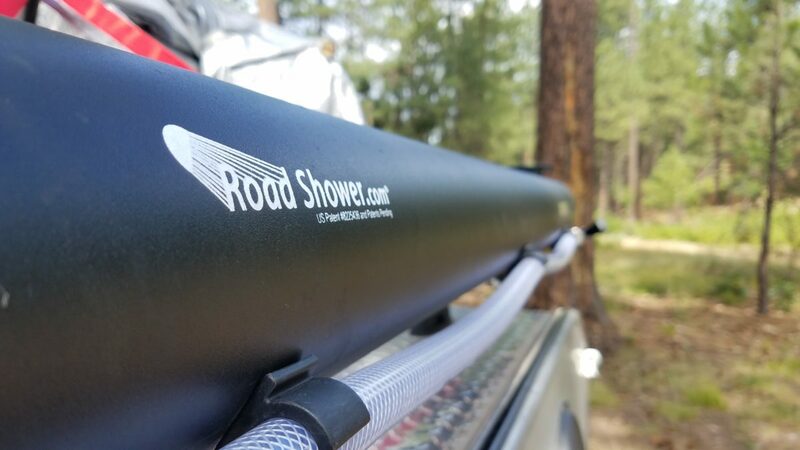 The road shower is extra water storage AND can be pressurized allowing us to use the attached hose and nozzle to shower, hose off the dogs or spray gear clean. The black, powder-coated tube heats the water inside during the day when the sun is on it. I’ve seen the temperature of the water get into the high 90s which is plenty warm enough for a decent backcountry hose-down before bed. After the first couple of nights in the trailer, my wife wanted a little more privacy. She picked up some material from a craft store and after much swearing and cursing (and the purchase of a new sewing machine) created curtains and door covers for the trailer. I installed the rods and now we have an easy and attractive way to get a little privacy when our camp neighbors are a little too curious. The Foxwing Awning is one of my favorite parts of our setup. I absolutely love how fast and easy it is to use. It’s out and set up in seconds and it doesn’t take much longer to put it away. In fact, we recently got caught taking down camp in a crazy rain storm and I really gained an appreciation for just how quickly the Foxwing gets put away. Rino-Rack (which makes Foxwing in collaberation with Oztent) also makes a floor covering cut to match the “winged” design of the awning. 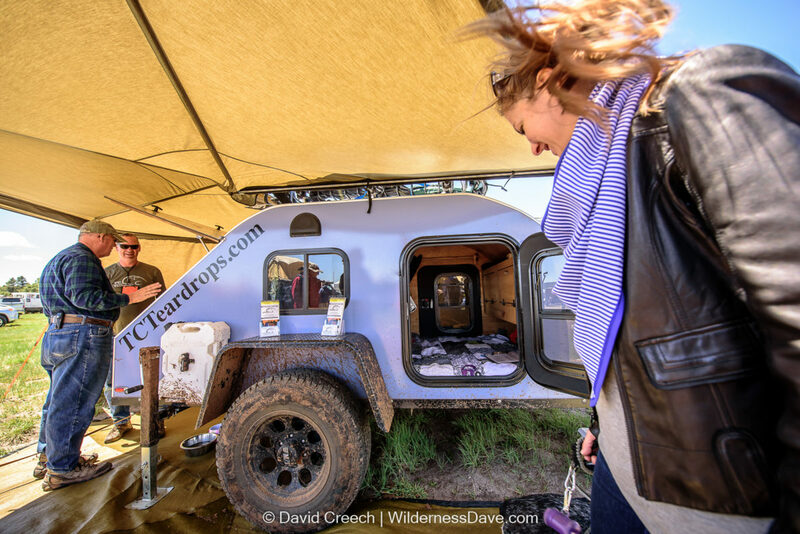 We saw TC Teadrops using one at their display for Overland Expo 2016 and decided it was much better than the cheap outdoor rug we’d been using, so we ordered one. The Foxwing is also open on all sides (as you can see from the pictures) which is fantastic except when the wind is up and I’m working in the kitchen. So we also ordered one of the removable sidewalls for the Foxwing so we can close off any one of the sides if we want to. We figure this could help as a wind block, a rain block or simply to create a little more privacy. It can also be used as an extension of the awning, offering a little extra shade. The next things on the list are mostly little items that will help make our trips run a little smoother. I will be installing a couple of floor mounts in the galley so I can strap down the cooler while we’re driving. Right now it’s loose and has a tendency to bounce and shift when the roads aren’t perfect. I’d also really like to figure out a way to drain the cooler as the ice melts without lifting the entire thing out of the galley. We are also looking for new camp chairs. The ones we have are OK and they pack up nicely, but they are very poorly made and started falling apart pretty quickly after we bought them. I like the design, I just wish they were built better. We’ve toyed with lighting options, but in reality, we don’t need much. We like to let it get dark and enjoy the night. Headlamps work for getting around outside and there’s plenty of light inside. I wouldn’t mind a little more light at the galley when I’m cooking late (or making late night cocktails) but it’s not necessary. I’m also very much considering another stove option that would give me some more cooking flexibility. I like to cook. I cook a lot at home and I like to have fun cooking on the road as well. The little Camp Chef stove works well for basic stuff, but I want something that will allow me to do some fancier cooking. I’ve got my eye on the Skottle from Tembo Tusk. They’ve been at Overland Expo the last few years and I’ve seen the cooktop in action. I think the skottle would be a nice kitchen addition. If you have any more questions about our trailer setup, TC Teardrops or any of the accessories please leave me a comment and I’ll try to answer what I can. 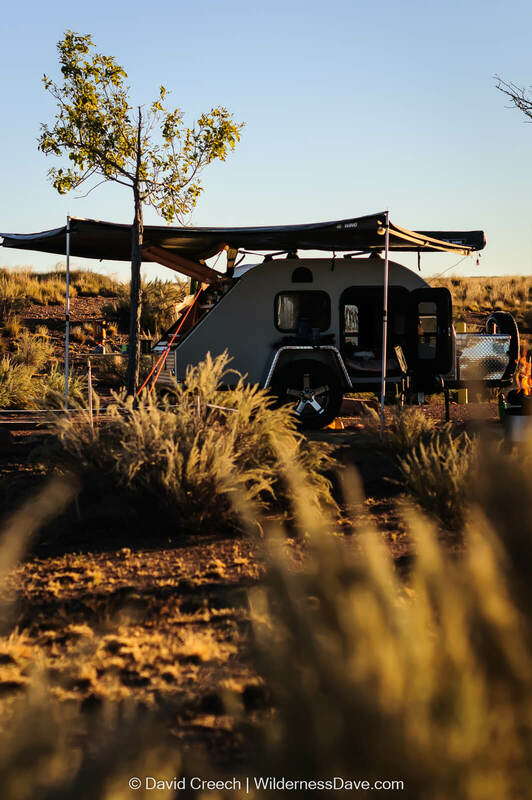 If you have a teardrop, or are ordering a teardrop, feel free to comment and let us know what you’ve done to dial in your trailer.